I hope you are well aware with CocoaPods and how to use this inside your XCode projects. If you are not well aware, follow my previous blog about how to use CocoaPods. Now it is time to learn to build your own Pod framework. Setup – What you need? Make sure your system is updated and you have latest Ruby Gems installed. Install CocoaPods if you don’t have Pods installed in your Mac machine. Open terminal and redirect to desired folder where you want to put your Pod Framework. Create your framework with the command pod lib create. Here I am giving my Pod framework name ‘MZFacebookManager’. What is your class prefix? .podspec file at the root is important file. This will contains your Pod version, dependencies, git url etc with some other Pod descriptions. You can edit the details, version and also define dependencies if your Framework is using any other third party Framework. Like in my case, my Framework is using ‘FBSDKLoginKit‘ and ‘FBSDKCoreKit‘. Once you are done with editing of podspec file you need to validate this file. You can do this with Pod lib lint command. Now open github website and create a new repository for MZFacebookManager (give your Framework name). Once it is created, go back to terminal again and push your code (You can also ignore this Push if you don’t want to push a default code on your git). But if you want to push, just make sure once again your .podspec file is defined the correct url of git repository. This will push the default code of your Framework. 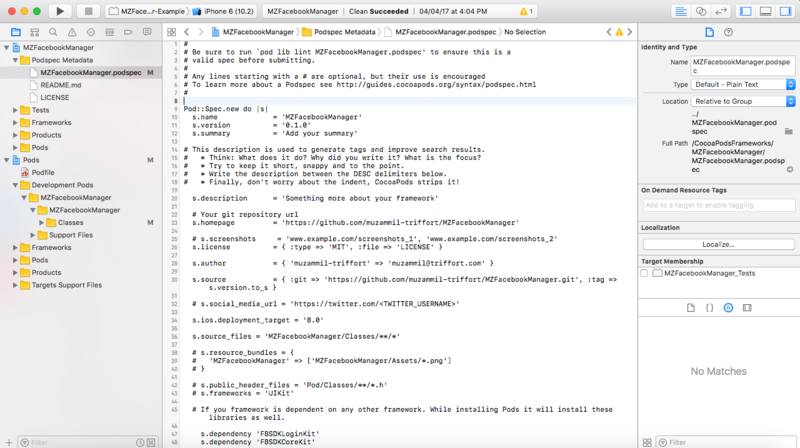 Now open XCode again and add your Framework files. Like i have added three files inside development i.e. 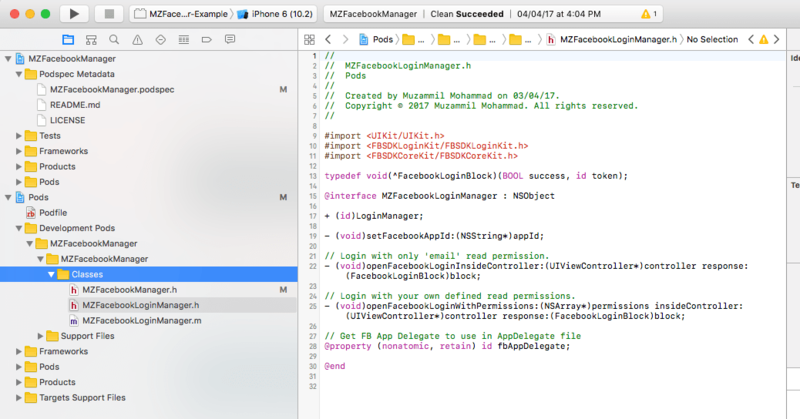 MZFacebookManager.h, MZFacebookLoginManager.h and .m files. These files will show when you install the Pod Framework. Once all files added and there is no error in your code. Update the version of your Framework by updating this inside .podspec file (0.1.1) and run lib lint command again to make sure everything is correct. When validation success, now first push the code on git by giving a tag. [!] You need to register a session first. Replace my email id and name with yours. This will send a verification link on your mail. Once you verified, you can continue with terminal. If all goes well Pod spec successfully update on git and you can see it is showing the description and other Pod details on home page of your git repository. You can also add –verbose in lib lint and trunk push command to see the detail result (in case of error). Yeah! You are done with your first Pod Framework. It’s time to have some nice coffee. If you already know how to install and use CocoaPods then continue else please first visit my previous blog “How to install CocoaPods in XCode” (for Objective-C). Using CocoaPods or any Objective C library in Swift is not a big deal. XCode is quite smart and it automatically do this for you. You can also check Apple’s documentation on this Using Swift with Cocoa and Objective-C. Once libraries are added, you only need to use a bridging header between Objective-C and Swift and use the new coding style of Swift for calling those methods. Like [MBProgressHUD show] become MBProgressHUD.show( ) etc. Here I am using the example of MBProgressHUD because it is normally used in most of the projects. 1. Create a new XCode project and select the language Swift (no need to to this if you already have Swift project). 2. Create a Bridging-Header.h file starting with your project name. like, if my project name is SampleProject, bridging header become: SampleProject-Bridging-Header.h and Put this header at the root directory of your project. If you are not very sure how to do this, the most simplest way is to add a test objective-c file in your project (remove that later). 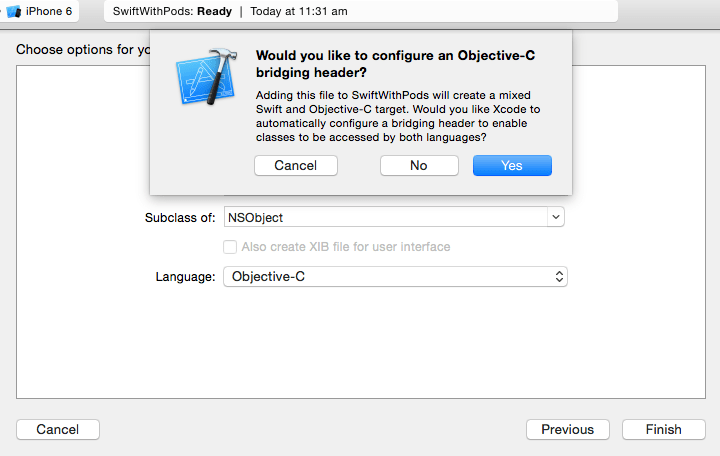 Xcode will prompt an option to configure bridging. When you press Yes, XCode automatically create the bridging file and put inside root of project directory. 3. Setup Pod with your project. 4. Add your Pod libraries inside bridging header file as you were normally using in Objective C project. Code that could be somewhere else is stored in your repository, wasting space. Sometimes, it’s hard to get a specific version of a library. There’s no central place where you can see which libraries are available. Finding a new version of a library and updating your project with it is time taking and sometimes, painful. Downloading libraries manually creates a tendency to perhaps make some changes to the downloaded code. The most simplest solution is to use CocoaPods. CocoaPods is the dependency manager for Objective-C and Swift projects. It has thousands of libraries and can help you scale your projects elegantly. CocoaPods is built with Ruby and is installable with the default Ruby available on OS X. Before installing Pods make sure you have installed/updated command line tool in your Mac machine. You can check this by opening Xcode, navigating the menu to Xcode > Preferences > Downloads > Components, finding Command Line Tools and select install/update. Also, make sure Git is installed in your Mac machine. Hurrah….You successfully installed CocoaPods in your mac machine. Now you can setup Pod with your Xcode project. 2. Change directory to your XCode project root directory (where your ProjectName.xcodeproj file is placed). 2. Change directory to your XCode project root directory. If your terminal is already running then no need to do this, as you are already at same path. 5. Add your library names in that text file. You can add new names (lib name), remove any name or change the version. If you are using CocoaPods 1.0 or above you also have to have a ‘target’ section in your Pod File. 6. Save and close this text file. Now libraries are setup and you have to install/update it. 7. Go to your terminal again and run this command: $ pod install (to install/update these libraries in pod). After successful downloading/installation of any single library, It will generate ProjectName.xcworkspace in your project root directory. From now use this workspace to open your project. 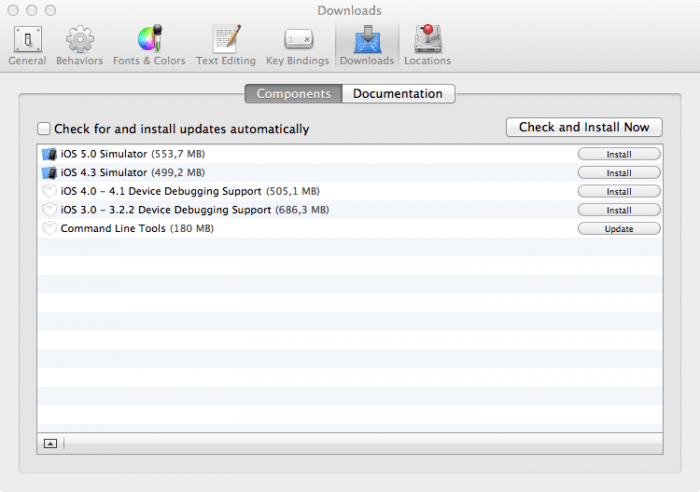 When you open your project work space you will see Pod is also added as another Xcode project with your Xcode project. If you open Pod it will show all libraries. or use sudo at start if getting error "You don't have write permissions for the /Library/Ruby/Gems/2.0.0 directory." 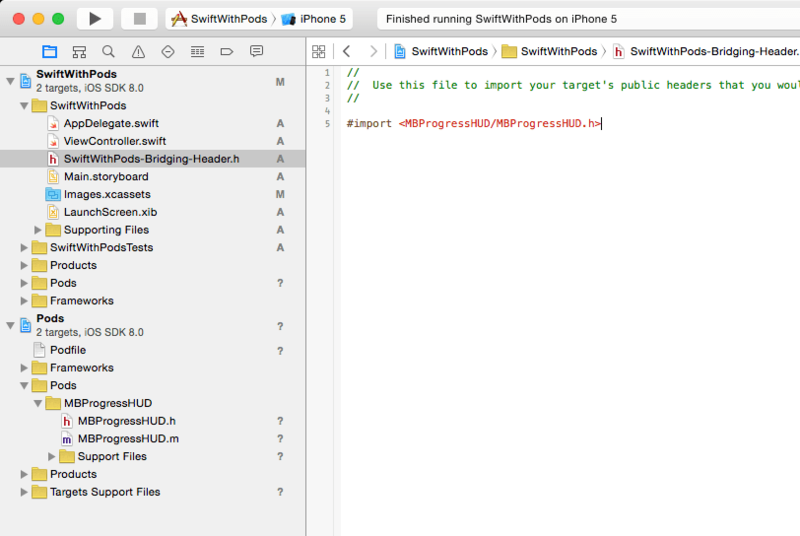 How to use Pod with Swift? Follow This.